Customer Focus: CNR Enterprises, Inc.
How can a small detailing shop increase the size of the jobs it can handle? For CNR Enterprises, Inc., the choice was clear – invest in a software product that will deliver a great return. Since the purchase of their first SDS/2 station in 1999, the staff of the Ashley, Illinois-based business has nearly doubled in size. 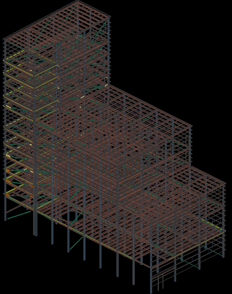 One of CNR's specialties is large industrial projects, such as the one shown here, modeled in SDS/2. The southern Illinois shop now employs seven detailers/checkers, each supplied with a full station of SDS/2, accompanied by all CNC modules. CNR specializes in structural steel, with projects that range in size from 100 to 4,000 tons for both industrial and commercial customers, including miscellaneous steel. CNR does projects all over the U.S. as well as in South America. Since the company was founded in 1979, CNR has advanced far beyond its board drafting roots. From SDS/2 Version 6.120 through current versions of the software offered today, the power of SDS/2 has provided a solid foundation for CNR's success. “We have enjoyed a good working relationship with Design Data's technical support and QA staff for many years. Whether our issues are software or hardware related, Design Data has been very helpful. SDS/2 Advisory Board members have also been willing to take calls and give advice,” said part owner, Reuss Bennett. The company is also owned by Charlie Bennett. Design Data has had CNR as one of its SDS/2 alpha testers for approximately three years. “Alpha testing has its challenges, but has definitely been worth the effort. I appreciate the fact that Design Data has been open to many of our suggestions. The advancements made within SDS/2 over the last few years have been great,” added Reuss. CNR develops innovative solutions for the construction industry with the assistance of Design Data's steel detailing software products. The relationship between these two companies will continue to flourish – along with their customer bases – far into the future with the additional advancements of SDS/2.